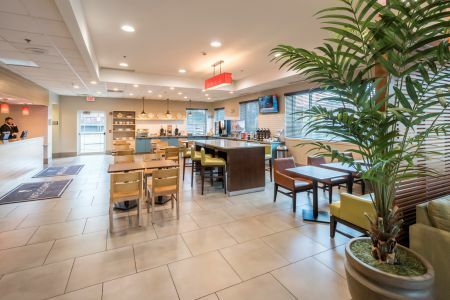 Located near Interstates 390, 490 and 590, the Country Inn & Suites® by Radisson, Rochester-Pittsford/Brighton, NY is the perfect place to ease off the road and recharge. In addition to being only minutes from the University of Rochester, our hotel is near three other colleges, including St. John Fisher College. Enjoy access to nearby restaurants, shops and downtown Rochester, as well. Traveling with family or want extra space? 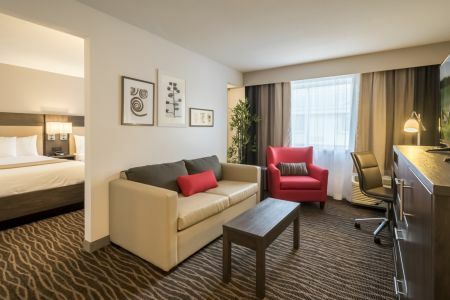 Book a Two-room Suite and enjoy a separate living room and all standard amenities. Fill up each morning with a variety of choices from our complimentary, hot breakfast. Featuring Belgian waffles, eggs, cereals, yogurt and more, our free, hot breakfast is sure to have something to please everyone. Lunch and dinner options abound in the nearby area. Make the short trip next door to Brick Wood Fired Pizza for flavorful pasta dishes and gourmet pizzas, or savor a tender steak and seafood at Black & Blue. Several other great restaurants are within a mile of the hotel, including Char Broil Family Restaurant. 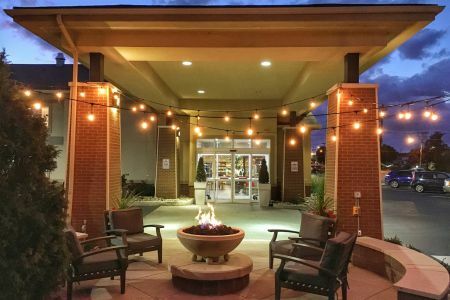 Pittsford Plaza – Less than a mile from the hotel, Pittsford Plaza is your one-stop destination for a Hollywood blockbuster, good food and plenty of shopping. Check out all your favorite stores including T.J. Maxx and Barnes & Noble. Highland Botanical Park – Just four miles from the hotel, this is an ideal spot for family activities like picnics, softball games and ice skating in the wintertime. Seabreeze Amusement Park – Drive 15 minutes to this theme park to enjoy a day full of pulse-pounding roller coasters and waterslides as well as rides tailored to the younger crowd. Let the Country Inn & Suites, Rochester-Pittsford/Brighton be your starting point for fun adventures in the Rochester area. 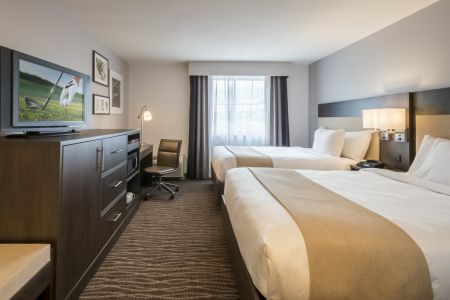 Whether you are an alumnus, a prospective student visiting one of the nearby colleges or a parent in town to see your son or daughter, our accommodations provide a relaxing haven after a busy day. Traveling with a tour group? We offer perks and discounted rates to your group during your visit. Learn more about our hotel’s group rates.